Fr. 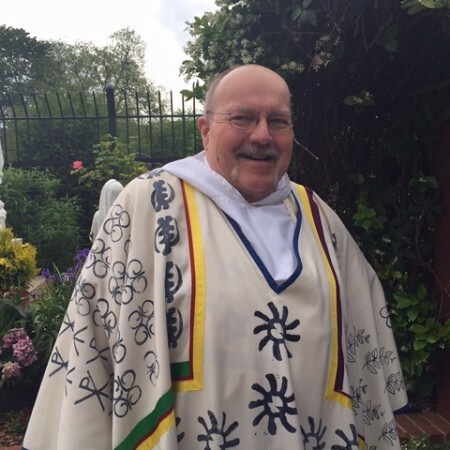 Bruce Barnabas Schultz, O.P., is a Dominican friar who returned to Our Lady of Lourdes in August of 2010 as associate pastor. (He had been ordained a priest at Lourdes in 1988 by Archbishop Eugene Marino.) Fr. Bruce, who has spent most of his three decades as a Dominican serving in the African American community, earned a Masters in Black Catholic Theology from Xavier University of Louisiana’s Institute for Black Catholic Studies. He has served in various roles in the Dominican Order, including President of the national Dominican Leadership Conference. A former journalist and actor, Fr. Bruce enjoys singing old jazz standards (like those sung by Nat King Cole and Frank Sinatra) and reading mysteries (by such authors as Walter Mosley, Margaret Coel, Tony Hillerman, Anne Hillerman, P.D. James, and Barbara Neely) as well as novels by Toni Morrison and Gabriel Garcia Marquez. He has wide and eclectic interests, including classic cinema, art history, Scripture study, American cultural history, and African American studies. He delights in the art of Fernando Botero, Edvard Munch, Romaire Bearden, Jacob Lawrence and Alexander Calder. In his younger days, he traveled widely, including to South Africa, Colombia, Costa Rica, Mexico, all the Caribbean islands with Dominican friars, Norway, Iceland, Sweden, Denmark, Germany, Greece, Spain, France and England. He’s lived in all four continental time zones – Milwaukee and Madison, Wisconsin; Salt Lake City, Utah; New York City and Atlanta; San Antonio; and Oakland, California.